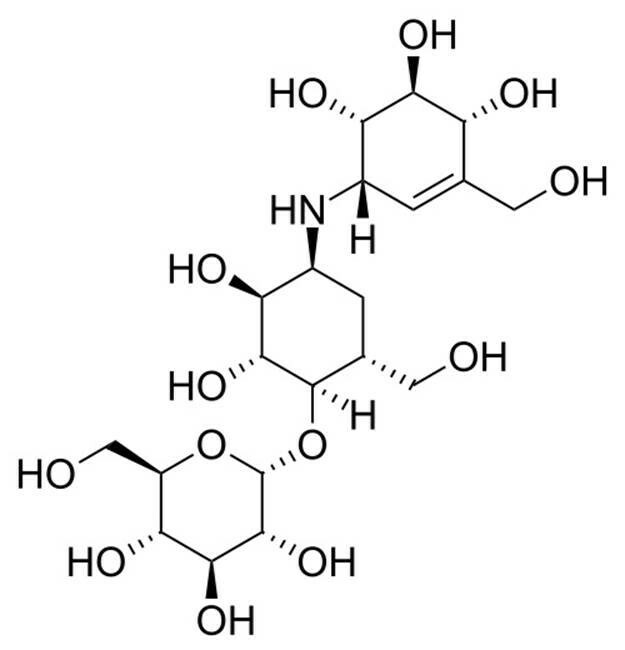 Validamycin is a fungicidal, aminoglycoside antibiotic known to inhibit trehalases in plants, insects, and fungi as well as enhance trehalose accumulation in transgenic plants. It is effective against Pellicularia sasakii and Rhizoctonia solani in plants, but only decreases their virulence instead of exhibiting a fungicidal effect. In addition, validamycin is used to control sheath-blight disease in rice and is most effective against soil-borne pathogens. It is used to study trehalase activity and the synthesis of trehalose. Aminoglycoside antibiotics are composed of amino groups attached to glycosides. They bind the 30s ribosomal subunit, causing misreading of the mRNA sequence and inhibition of translocation. Consequently, protein synthesis is inhibited. Storage/Handling: Store desiccated at -20°C. Soluble in water.